Acute otitis media (AOM) affects more than 8.8 million children annually and antibiotics are prescribed for AOM more than any other childhood illness. Acute otitis media results when serous fluid collects in the middle ear cavity and becomes secondarily infected. Serous fluid develops in the middle ear cavity due to eustachian tube dysfunction usually in response to inflammation, a viral upper respiratory infection, allergic rhinosinusitis, or barotrauma. Much of what is known about acute otitis media in adults is extrapolated from pediatric literature. The most common pathogens in adults and children are streptococcus pneumonia, non typable haemophilus influenza and Moraxella catarrhalis followed by staphylococcus aureus, and beta hemolytic streptococcus. Studies have shown that viral causes represent 25% of cases in children but this figure is unknown in adults. Adults with acute otitis media are more likely to have underling ear disease including cholesteatoma and chronic otitis media. In addition, they are more likely to have an underlying disease, such as diabetes, that results in a higher incidence of complications. II. Diagnostic Confirmation: Are you sure your patient has Otitis Media? AOM is often preceded by a viral upper respiratory illness. Symptoms tend to be unilateral and often superseded by viral or allergic rhinosinusitis. It is characterized by fever, otalgia, and conductive hearing loss (on average a 25 decibel loss). Purulent otorrhea can occur in the setting of a ruptured tympanic membrane. Associated symptoms can include vertigo, tinnitus, and a sense of ear fullness. The incidence of acute otitis media in adults is unknown. However, up to 15% of patients referred to otolaryngology clinics for otitis media are adults. Otitis media is much more common in the pediatric population with the incidence markedly decreasing after the age of 7. C. History Part 3: Competing diagnoses that can mimic Acute Otitis Media. The differential diagnosis includes otitis media with effusion, chronic otitis media, acute mastoiditis, and bullous myringitis. Otitis media with effusion (OME) is the presence of middle ear fluid without infection, and usually results from barotraumas or allergy. Acute mastoiditis, inflammation of the petrous bone adjacent to the middle ear can range from a mild infection to life threatening and can be especially severe in the elderly. In chronic suppurative otitis media there is purulent otorrhea due to a persistent infection of the middle ear due to a perforated tympanic membrane. Finally, bullous myringitis is a form of acute otitis media in which blisters appear on the tympanic membrane in response to viral, bacterial, and mycoplasmal infection. A “red eardrum” or an ear with “fluid” is not diagnostic of AOM in the absence of bulging or otorrhea according to the American Academy of Pediatrics 2013 guidelines. Physical examination signs include erythema and immobility of the tympanic membrane. The 2013 AAP guidelines for the diagnosis and management of AOM highlight the importance of pneumatic otoscopy. Examination of the tympanic membrane with a pneumatic otoscope is the standard method of diagnosis. Immobility of the tympanic membrane when applying pneumatic pressure using a pneumatic otoscope confirms the presence of a middle ear effusion. This finding together with evidence of tympanic membrane erythema and opacification makes the diagnosis of acute otitis media. Otoscopy may also reveal purulence in the ear canal if there is an associated tympanic membrane rupture. No laboratory tests are necessary in the outpatient setting. Imaging is only required if a complication is suspected. Computed tomography (CT) scan of the head with intravenous contrast can confirm the presence of a subperiosteal abscess and mastoiditis. It can also reveal the mucosal thickening in the middle ear space which is indicative of chronic suppurative otitis media. 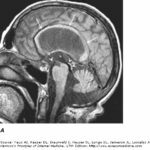 Magnetic resonance imaging (MRI) with gadolinium can detect brain abscesses. In patients with fever and headache, a lumber puncture is required to rule out concomitant meningitis. An audiogram will determine conductive hearing loss in otitis media and help to rule out labyrinthitis which results in sensorineural hearing loss. In children, viral and even some bacterial cases have been shown to resolve spontaneously. Therefore, the AAP suggests considering holding off antibiotics for children over 2 years of age with an uncertain or mild case of acute otitis media. The AAP 2013 guidelines recommend antibiotic treatment and management guidelines are demonstrated in Table I. Since there is no data to document the safety of withholding antimicrobial treatment in adults, antibiotics should be used routinely in treatment of acute otitis media in this age group. Most cases can be managed as an outpatient basis. The preferred antimicrobial drug has coverage against pneumococcus, hemophillus influenza, and moraxella catarralis. For most adult cases, amoxicillin 500mg by mouth three times per day is sufficient. In penicillin allergic patients, azithromycin is preferred. Uncomplicated cases should resolve in 48 to 72 hours. Lack of response may indicate a resistant organism or development of a complication. These patients should be reassessed with an in depth neurologic exam and otoscopic exam. In patients without evidence of complication, a trial of amoxicillin/clavulanic acid or a single dose of intramuscular ceftriaxone is warranted. Tymphanocentesis may be necessary in antibiotic resistant cases as MRSA and fungal pathogens are possible causative organisms. Tymphanocentesis involves surgical puncturing of the tympanic membrane in order to remove fluid from the middle ear which can be sent for bacterial and fungal culture. When infection results in acute rupture of the tympanic membrane, treatment consists of a combination of oral and topical antibiotics, as well as preventing water entry into the ear canal. Otoscopic drugs that are not ototoxic, such as ofloxacin otic solution, are the treatment of choice. Otic solutions containing aminoglycosides such as neomycin/polymyxin B are contraindicated when the tympanic membrane is perforated. In most cases the tympanic membrane will heal but in rare cases there can be a chronic perforation leading to persistent purulent drainage causing chronic suppurative otitis media. These patients should be referred to otolaryngology. If a complication is suspected, the patient should be hospitalized immediately for further diagnostic workup and initiation of appropriate IV antibiotic. Otolaryngology and infectious disease consultation are recommended. Myringotomy may need to be performed urgently to prevent progression of complications and obtain material for culture. Perform an otoscopic exam, neurologic exam including assessment with the rinne and weber test to determine hearing loss. Audiogram for severe cases or those who have developed a complication. Failure to recognize complications such as mastoiditis, subperiosteal abscess, or meningitis. Failure to diagnosis tymphanic membrane rupture and treat with topic antibiotics. Failure to perform exams to evaluate for hearing loss. Close monitoring of blood glucose and adequate diabetic control. Mental status changes can signify a neurologic complication such as brain abscess or meningitis. Continued fever or failure to respond to oral antibiotics can represent either infection with a resistant organism or development of abscess or mastoiditis. In both cases, Otolaryngology consultation is advised. If patient has developed complications such as mastoiditis, abscess, or hearing loss, they will need Otolaryngology follow up. Most cases are self limited or respond well to oral antibiotics. Jero, J, Leskinen, K. “Acute Complications of Otitis Media in Adults”. Clin Otolaryngol. vol. 30. 2005. pp. 511-516. Rosenfeld, R, Culpepper, L. “Clinical Practice Guideline: Otitis Media with Effusion”. Otolaryngology-Head Neck Surgery. vol. 30. pp. supplement s95-s114. Casselbrant, M, Mandel, E, Flint, P. “Acute Otitis Media and Otitis Media with Effusion Cummings Otolaryngology: Head & Neck Surgery”. 2010. pp. 2761-2777. Rettig, E, Tunkel, D. “Contemporary Concepts in Management of Acute Otitis Media in Children”. Otolaryngol Clin N Am. vol. 47. 2014. pp. 651-672. “American Academy of Pediatrics 2013 Guidelines The Diagnosis and Management of Acute Otitis Media”. Pediatrics. vol. Vol 131. March 2013.